Lucius Vorenus soaks up some rays on a beautiful winter afternoon. Postings have been light of late because of the holidays and New Years visits from out of town guests. The holidays provide their own respite from some farm tasks – our broilers and turkeys are gone for the year, and there was only a steady hum of morning and early evening chores, consisting of feeding and watering the hogs, chickens, ducks, and goats. And our goats are drying off as they get further into pregnancy, so there is less to do there as well. 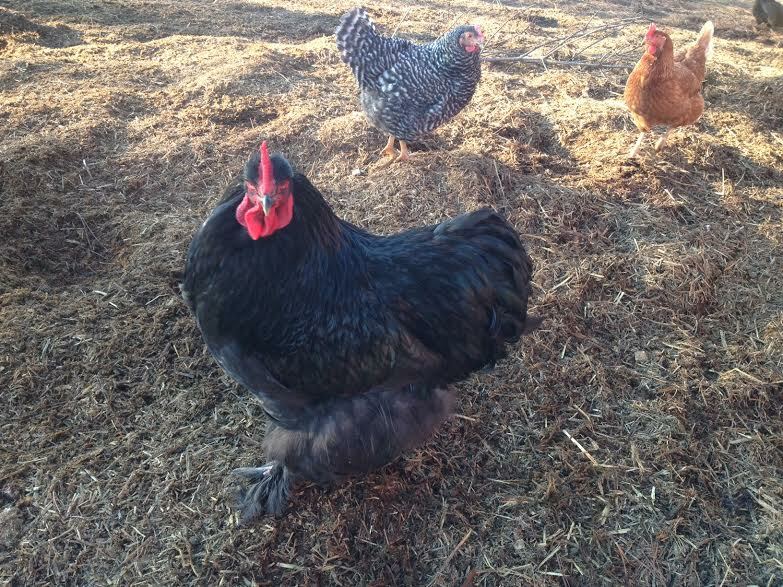 Another she turns out to be a he – this gargantuan black Cochin rooster previously known as Fluffy Feet but now affectionately referred to as Fluffy Cojones has been doing his best to steal what he can of Lucius’ harem. January has offered us a lovely break: the weather has been either cloudy and in the 30s or sunny and in the 50s. My friend Bob from Pennsylvania visited for several days during which we spent a rapturous morning in the Japanese Gardens in Portland – beautiful any time of year, even in the bleakest part of winter. The next day was equally lovely – a Sunday in the high 40s with bright sunshine, during which we visited a number of wineries, bought more than our share of wine, drank more than our share of wine, and then had a fabulous lunch at Nicks, a local restaurant with some wonderful Italian specialties, including better tripe than I’ve had in Rome (it shouldn’t surprise, the owner/chef is Italian). The following weekend Lori and I got our first getaway in years, storm watching by a warm fire at a hotel in Lincoln City right on the ocean and then heading down for a great dinner at Becks at the Whale Cove Inn in Depot Bay – 6 courses, each paired with a wine from Bethel Heights, a winery about 15 miles down south of us. The downside of the weekend was that we came home to some unpleasant surprises, since the storm headed inland and ripped the roofs off our chicken tractors and turned our buck shelter upside down, but the animals were fortunately none the worse for wear, and the damage easy enough to repair. But our break won’t last long. There is a great deal to do even in mid-winter; and with out 50 degree days and nights in the mid 30s, spring does not feel far away. This year we are determined to renovate the gardens on the front of the property and around the front of the house. That entails lots of clearing of brush, cleaning of debris, and carting barrel after barrel of compost for mulching. I’ve already planted spinach in our raised beds, and lettuce, mesculin, and chard in our green house for early spring harvest. This Saturday we mucked out the barn – something we’ve not done since July – in an effort to get it cleaned up for kidding in March. We moved six months worth of straw, manure, and urine for approximately 8 hours. By the end of Saturday we had a pile that was about 12 feet long and six feet high. By Monday morning the pile was steaming as the mixture began to compost and cook; it steamed all day and had already compacted by about a foot. Sunday morning, in an effort to manage the pile and make sure that it could season properly I cordoned it off with poultry netting so that the chickens wouldn’t scratch it down and destroy it – something they could do in a day. Mucking takes its toll physically, and we are still recovering two days later – no one has been able to move very fast around here. 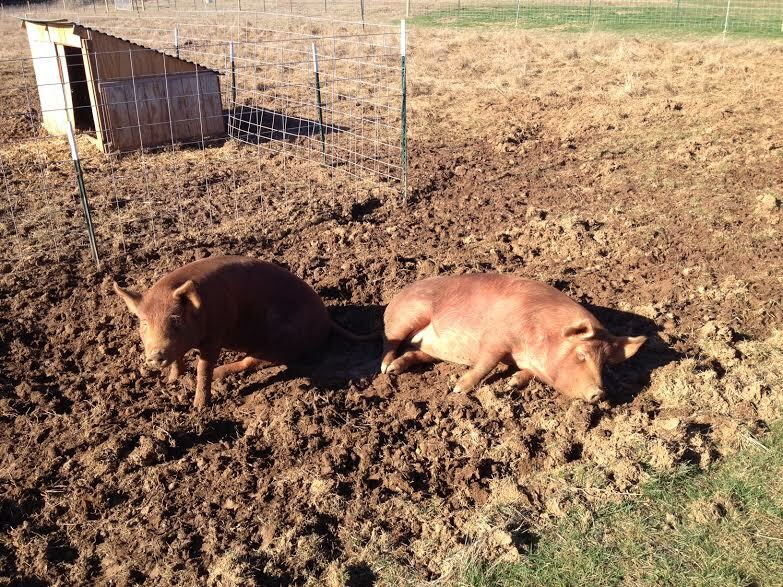 Laverne and Shirley enjoy a mud bath on a sunny Saturday afternoon. 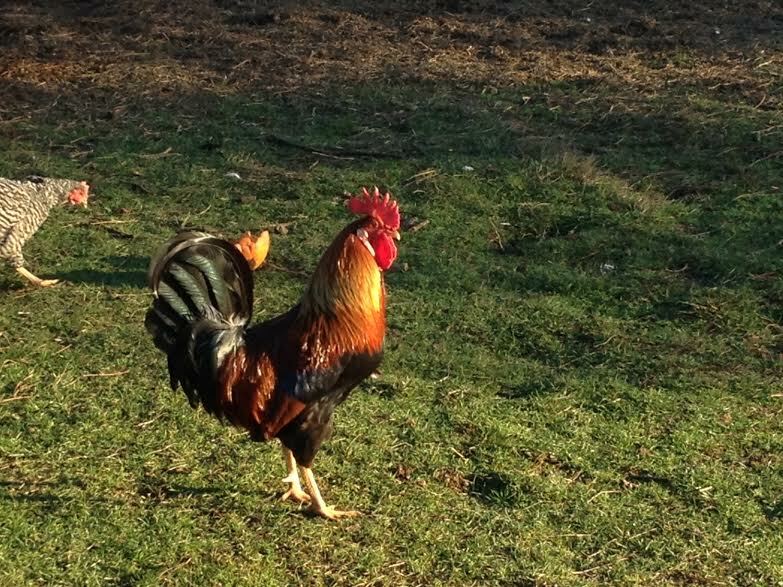 On the seventh of February we are already – unbelievably it seems – set to start up again with our broilers – we will have 50 red rangers out on pasture again by March and ready to be harvested in time for the first farmers market in May. On the same day we will have another half dozen or so Kakhi Campbell ducklings arrive – our mature little trio is great, and steadily gives us three eggs daily, even in January. Nancy socializes with Shirley on a lovely Saturday evening. 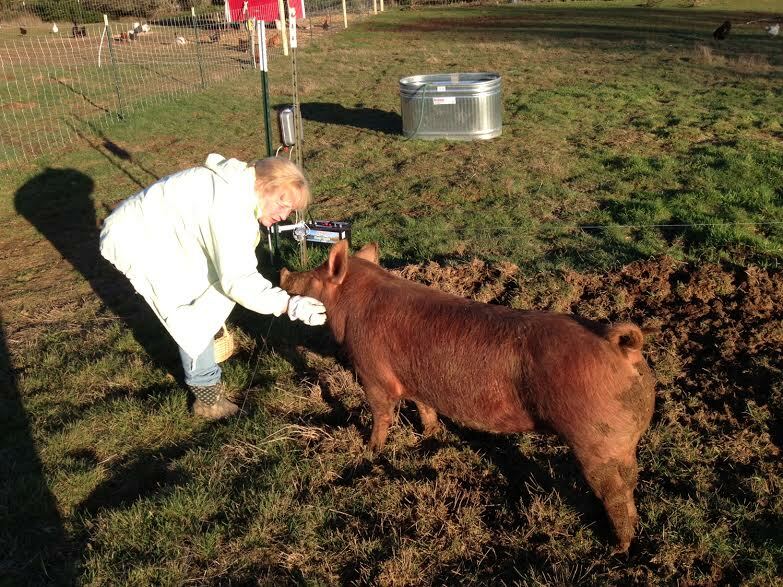 Both Laverne and Shirley still have a ways to go before they become bacon sometime this spring. The same week we are also set to get in a batch of fruit trees, mostly a variety of different apples for making hard cider, but also another plum and a pawpaw – we are hoping with all of our excess fruit to feed more hogs this coming fall. Yesterday was absorbed by our neighbor having two heifers slaughtered – since we now know the butcher and have used him ourselves, and had purchased for meat half of one of the animals, we went down to chat and in the process learned more than we ever thought possible about beef cattle. Also, full confession, I had seen and read about the slaughter of bovines so much in the course of teaching Roman religion over the years, (Roman religious practice entailed frequent animal sacrifice), that my intellectual curiosity got the better of me. I wanted to see how an animal this size was slaughtered, skinned, gutted, and carved. It was an education to say the least. 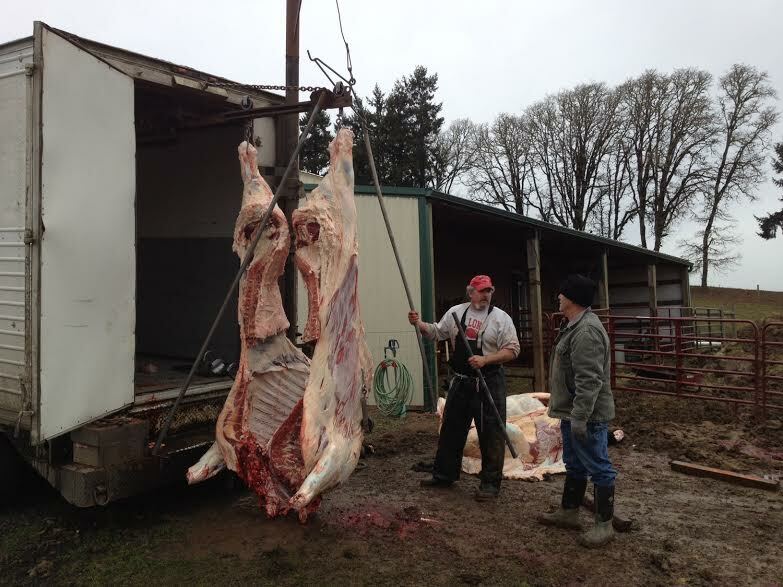 Greg’s heifer had a hanging weight of over 700 lbs. Of course, modern cattle are somewhat larger than those with which the Roman haruspex and his attendant priests had to deal! By the end of the day we left with the priestly share of the offal, including beef heart, liver, tongue, tail, and sweet breads, all of which filled a bucket with about 40 lbs. of fine quality beef. The liver was a particular surprise – its size was enormous, and I had to practically hug it to heft it out of the bucket. When the butcher examined it he declared it healthy, noting the presence of a single worm in it, which is not uncommon – in Roman antiquity a priest called the haruspex would examine the liver for such marks and signs as a form of communication with the gods. We will soon smoother the liver in onions and bacon and gravy; marinate and stew the heart in wine and herbs; roast and spice the tongue; and braise the oxtail to make a nice coda alla vaccinara served with pasta or gnocchi. In the course of all this chores continue – ducks and chickens need to be tended and eggs gathered; pigs fed, massaged (yes, massaged), and given their morning beauty milk (! 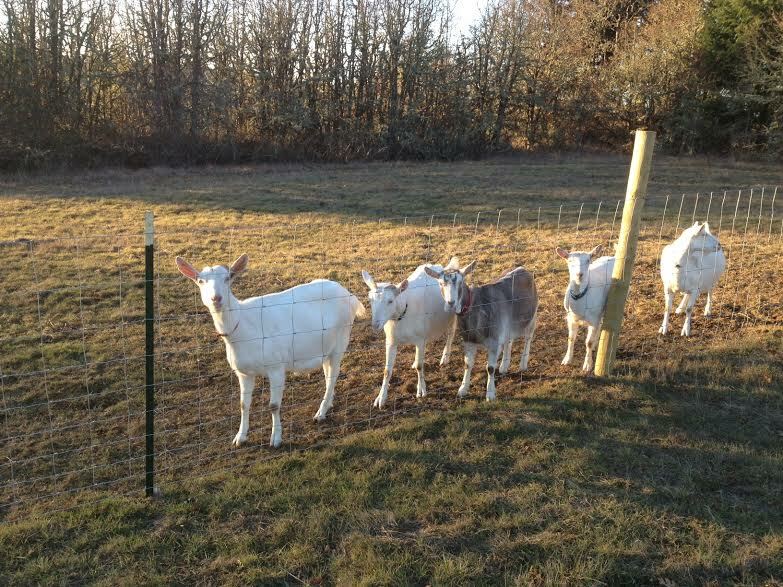 ); goats milked, fed, and taken out to pasture in the morning and brought in again in the evening; plants need to be tended, watered, and pruned; equipment needs to be cleaned and maintained. We will be deworming our pigs in the next couple of days, and then start them on a regimen of beer and grain in the evening to supplement their morning milk. On top of everything else, we all remain busy with various other outside activities – in my case, teaching at Linfield and volunteering one day at YCAP (the local food bank). Our little herd enjoys some late winter sunshine out on pasture, where they can browse on oak and bramble. This past month we received some very validating evidence for the power of eating your own farm raised foot: both Nancy and I had to have blood work done – including cholesterol, liver function, glucose, kidney, and all that fun stuff. For both of us, despite the consumption of copious amounts of fried chicken, strawberry rhubarb pie, eggs (with abandon), and (in my case) hard cider, our numbers had substantially improved. The real stunner was that these good numbers came at a time that, at least for me, is the worst time of year eating-wise, following the holidays and some truly fabulous meals at some local eating establishments. The numbers for me were surprising because we do not skimp on eating our own eggs – during the summer I was eating well over a dozen a week, and Lori and Nancy were doing the same. But everything here we eat is fed on a mix of commercial feed, grass, and various inputs from our farm or the farms around us. Our neighbor across the street, from whom we now buy all of our beef, feeds them almost exclusively on grass. Our broilers get plenty of exercise on grass, eat grass and some commercial feed, and of course, plenty of bugs – same with our layers, who in addition, get to scratch in our goat barn, in the process keeping down the parasite and fly population. Our ducks get a cup or two of feed a day and spend the rest of the day snurfling through the dirt and grass in our large vegetable garden. Our goats eat a modest ration of oats and molasses but, for the most part, get grass, alfalfa and browse. We simply do not give feed with corn or soy and use no medications for our animals unless they are sick. 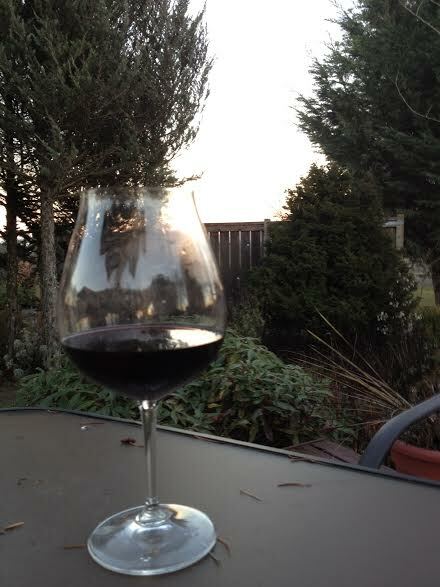 Drink more Pinot Noir – it’s good for you! Especially on a pleasant winter evening in your garden. As we finish up the first month of the new year, we hope that the clear, clean liver of the heifer sacrificed yesterday will be a sign of good omen – for health, prosperity, and abundance for our fruits, for our gardens, for our orchards, our animals, and ourselves. Twelve gods can’t be wrong.